'Srisun Prata.Com’, serving only South Indian cuisine started out in 2004 with an outlet located at Block 418, Yishun Avenue 11. Over the years Srisun Prata.Com has expanded to 13 outlets island wide. 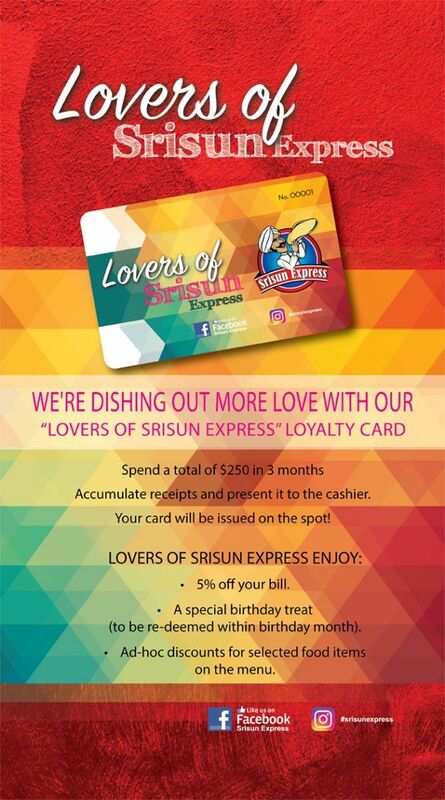 With regular customers increasing requests for North Indian cuisine as well as a desire to bring a wide variety of comfort food to the heartlands, Srisun Express was born in 2012 with its first outlet at Blk 212 Hougang St 21. Open 24hours, we were privileged to serve a wide spectrum of diners, from the weekday office crowd to families and the night owls who were just looking for a good place to ‘lepak and makan’ with friends. Today, our menu has expanded to include perennial favourites of North & South Indian, Malaysian, Western and local cuisines. It doesn’t stop there. At Srisun Express we’re constantly looking to introduce new flavours, keeping your taste buds on the edge. Our new menu includes our very own signature Sugar Rush Prata, Honeymoon Prata, Masala Buffalo wings, Goreng Specials, and a whopping 54 types of savoury and dessert pratas, as well as a drink menu that ranges from the usual Teh Tarik to Butterscotch Milkshakes and Mango Mojitos. We’re open 24 hours a day and with such an extensive menu, we hope to cater to every taste bud and craving. We’d like to thank you for dining on board the Srisun Express, now let the food adventure begin!